“I’m coming on Sar-El,” I replied. “What is Sar-El?” the security person asked. Once I had my luggage, I found the sunglass stand where volunteers typically meet, and Sar-El’s facilitator, Pam Lazarus, an expat who had made aliya 17 years ago. Since its founding in 1987 by General Davidi, volunteers come from around the globe for one to three weeks’ stint on an army base. Qualifications include a love of Israel, being of sound mind, a clean bill of health, physically fit, and able to carry your own luggage. You do not have to be Jewish. There is a registration fee and the flight to Israel is paid by the volunteer. Weekends are the responsibility of the individual. While on the base, each person is assigned a room, which they will typically share with one or more persons, and is given three meals a day. Some bases will even organize a free day trip to somewhere of interest. I was assigned to a medical supply base near Tel-Aviv. This base does not have soldiers on it but rather reservists and fulltime employees. Upon my arrival at the base I was given my army uniform. The correct size is not high on the priority list, as I discovered. I spent the next three weeks in a very roomy pair of pants, which I held up with a belt, a khaki T-shirt and shirt, and an army jacket. I felt so proud wearing this uniform! A typical day is as follows. Breakfast in the main dining room is at 7:15 a.m. At 7:45 a.m. we meet up with our 19-year-old madrichot in the courtyard for the raising of the flag and the singing of the national anthem, and then we get news from within Israel and abroad. Then it is off to work until midday, when we make our way to the dining hall for lunch. This base is the main military medical base in Israel and also the primary depot. Every 18 months, medical military units drop off complete medical supplies. They then pick up new and replenished supplies for the next 18 months, which are divided between bases. Medical supplies with expiry dates between 6-18 months are used first in hospitals and emergency rooms, while supplies with a 6-month expiry date are utilized for training purposes and donations to third-world countries. Medical kits are made up for many applications, such as atomic and biological chemical kits, combat doctors, and combat medics. I had a great boss, who patiently explained exactly how to do things. Israel is a first-generation Sabra, whose family emigrated from Bucharia. He never stopped thanking us for our service, as did many Israelis I met off the base. They are so grateful for the volunteers’ service . This, in turn, was so gratifying for us, knowing we were making a difference by giving back just a little to the country. It was an even better feeling when medical backpacks were returned to us with medical supplies unused! The workday ends at 4:00 p.m., when you are free to do whatever you like within the confines of the base. You are not at liberty to leave it, other than at the end of the workweek. Dinners are eaten early. Thereafter, the madrichot hold discussion groups or show movies. By 9:00 p.m., most people are ready for bed. Weekends we may go anywhere in Israel as long as we are at the Tel Aviv’s main train station on the Sunday morning at 9.30, when the volunteers are taken back to their base. At present there is a hostel in Tel-Aviv specifically for Sar-El volunteers’ weekend stay. Accommodation is free, with meals included. This is a great alternative for those who are on a tight budget. It is not fancy, but central to Tel-Aviv’s hub and the beach. One tends to forget one is in a country in a constant state of war. The zest for life is unbelievable, which I noticed on my weekends in Tel-Aviv. The bustling traffic; people sitting at coffee shops and in restaurants; shopping at the Carmel Market; youngsters speeding down busy main intersections on their electric scooters; hip-looking men and women walking along the beautiful promenade with their dogs; beachgoers laughing and listening to music; picnickers on the lawn with little children frolicking nearby; buskers entertaining the passing throng. What a beautiful, perfect picture it painted in an imperfect world. Three weeks went by in a flash and soon it was time to return to Toronto. I looked for any reason that would enable me to stay, but as the saying goes, all good things must come to an end. But it doesn’t have to end here; I will return to Israel. In fact, I am already looking at calendar dates. I would highly recommend Sar-El for anyone who loves Israel and wants to do something so worthwhile. Israel will welcome you with open arms and she will thank you. Thank you for a detailed account of your experience. I am going for 2 weeks in June 2019. I was born in the Soviet Union but has lived in Montreal since I was 14. 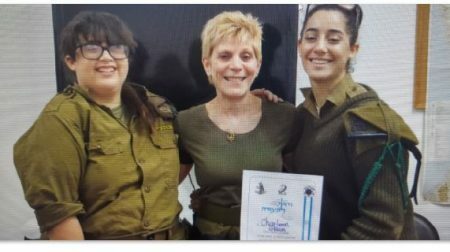 I will be proud to wear the IDF uniform and help out in a very small way. My husband is a Sabra and this is my way to thank Israel for my good life! Previous PostPrevious Our First Sar-El Experience – Robin B.